The Sherman IC 2nd «Warsaw» Armoured Division (of the 1st Squadron, 4th Armored Regiment «Scorpion», 2nd Armored Brigade, 2nd «Warsaw» Armored Division of the Polish armed forces in the British army) is a gift Rank III British medium tank with a battle rating of 4.7 (AB/RB/SB). 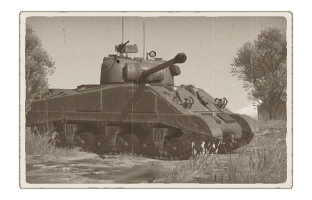 It was introduced in Update 1.53 "Firestorm" and is one of the first British tanks introduced in the game. Using the Sherman as the basis, the British added their famed 17-pounder anti-tank gun to the turret, making the tank a very potent weapon against heavily armoured tanks of its battle rating. This variant of the Firefly represents a version utilized by Polish armed forces operating within the British army. 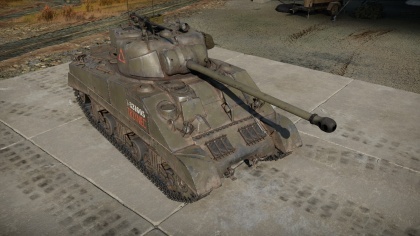 The Sherman IC Firefly has since been removed from store listing in the 2018 Summer Sale. The Sherman Firefly is easily distinguishable by its very long gun, even compared to the Shermans with the American 76 mm guns. The muzzle brake on the cannon is also in a spherical shape rather than a horizontal rectangular shape so that is a distinction between the 76 mm cannon and the 17-pounder. This tank should be the supporting line in both offensive and defensive actions, providing flanking fire, long-range fire, or fast and accurate fire to the target while the heavy tanks take up the brunt of the defense. The tank is as mobile as the M4 Sherman, so picking up speed to get around the enemy is not hard. Those familiar with a M4 Sherman control will pick up on this tank very easily. While this tank is also capable of being the frontal attack unit for an assault, it is strongly advised not to due to the thin armour of the tank, necessitating the users to always get the first shot off in an encounter, otherwise the enemy will be able to destroy the Firefly easily. The right side of the turret has extra armour that is 88.9 mm thick. Shoot and scoot. 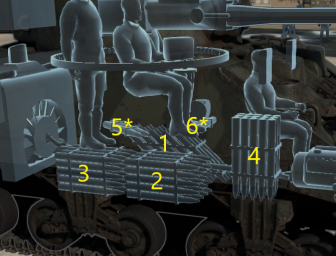 Unless the enemy's tank gunner has been knocked out (black only), cannon breech has been disabled (red/black), or cannon barrel is disabled (red/black) that inhibits the enemy's ability to fire back, don’t expose the tank after firing. Always try to retreat back into cover to reload. Once reloaded, preferably pop out of an area different from the last firing position and take another shot. Make sure to eliminate the enemy's ability to fire back by destroying their cannon breech and traverse gears, or knock out their driver and gunner again if they were replaced. During this whole process, watch out for other enemy tanks and avoid being swarmed. With situational awareness combined with the correct usage of the map, the Firefly becomes a decent tank capable of effectively fighting every medium and heavy tank it faces. The Sherman IC Firefly was removed from War Thunder stores after the 2018 Summer Sale event. The Sherman IC Firefly was made available again in the 2018 War Thunder anniversary, purchaseable via Golden Eagles in the game rather than from the store. Sherman Firefly - Normal tech tree version. This page was last edited on 23 February 2019, at 01:19.